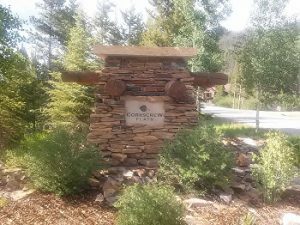 Corkscrew Flats are newer Breckenridge homes for sale in Breckenridge CO Real Estate. Located off of Wellington Road approximately half a mile from Breckenridge’s Victorian Main Street. Built from 2005 to current there are 38 lots in all of Corkscrew Flats ranging in size from 0.30 – 0.52 acres. These beautiful Breckenridge CO homes range in size from 2,548 – 4,024 square feet with 3, 4 and 5 bedroom floor plans. Many of the Corkscrew Flats homes for sale in Breckenridge CO Real Estate have additional rooms such as an office, media room and second living rooms. There is a mix of existing homes and vacant lots to chose from. The existing Corkscrew Flats homes are nicely finished with gourmet kitchens with slab granite counters, high-end appliances, wood floors and much more. The location of these Breckenridge homes gives them panoramic Breckenridge Ski Area and Ten Mile Range views. Corkscrew Flats Breckenridge homes are spectacular newer homes close to town and skiing, arrange a showing today of these beautiful homes or other homes for sale in Summit County real estate.